Walking into a church, the first image that hits you is a middle aged pastor flaunting his confusing haircut and shiny grey suit coupled with a set of huge golden rings. However, worshippers at Bethel Gospel assembly Ministry in Juja do not have to live through that as their preacher is not only professional but also oozes of youthfulness. 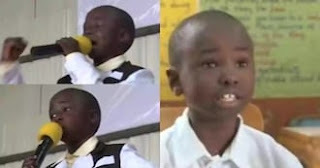 Victor Muteru, an eight-year-old pastor from Juja has taken the internet by storm after K24 captured him preaching with so much vigour at his local church. The young boy holds the microphone with so much prowess and spits the verses of the bible like a true pro. Both the young and old sit tight and listen to the young, gifted cleric whenever he steps on the pulpit and delivers a mind blowing sermon. According to the young boy, he discovered he had a gift of evangelism when he was just five-years-old. From then on, Victor has never looked back. He can recite the verses of the bible back to back and has a conviction that can put anyone to shame. "I am not the one who decided to call myself reverend. God called me, I did not even know the meaning of that word in the beginning. My mother would beat me and caution me against it all. You have no idea the struggle I had to go through with my mum. It reached a point where I just wanted to end my life,"
the young pastor revealed. The little boy even organizes and runs crusades for worshippers during the weekend.